After years of admiring ornately decorated department store windows and towering Christmas trees in New York City during the holiday season, I wanted to experience how another city celebrated the most wonderful time of the year. My travels took me to London to visit a friend that lives in South London, next to the Clapham Common. The Clapham Common is a large 220 acres triangular park with ponds and lots of walking paths. One of the best parts of London parks that I learned on this trip is that they are all dog friendly! A friend of mine and I have been making the effort lately to explore more of our great city. New York is known for it’s numerous incredible restaurants across a wide range of cuisines. With a variety of cuisines, it can be very easy to slip into a rut and continue to visit the same, comfortable places over and over again. Over the next few months, we are going to make an effort to branch out and explore new boroughs, new restaurants and really appreciate all the variety in this city’s restaurant scene. We kicked off this “Dinner Club” with a visit to the Joe’s Shanghai location in Chinatown. This restaurant is an institution in New York, with the original location in Flushing, Queens. In addition to this original location, another location appears in Midtown as well. In order to fill our desire for more of an authentic experience, we decided to visit the location on Pell street. After walking into the restaurant, I was immediately caught off guard by a simple yet distinct element. This element happened to be the very unassuming dining experience. My initial shock sprung because many people have spoken highly of this establishment, leading me to except something completely different. Upon entering, you are greeted at the door by an aquarium full of very large coy fish. We were seated immediately, but once again found ourselves surprised when we were seated at a table with four other people. The drink menu was hilariously limited to four different types of beer. But that was not the focus of the evening. The soup dumplings were the stars of the night. This signature dish is something I’ve dreamed about trying for a while due to its combination for two of my passions: delicious soup and carbs. My friend taught me the technique for slurping the hot broth out of the dumpling before biting into the pork inside. One of the pairs at our communal table only had two orders of the dumplings and beer but I didn’t judge them one bit for that choice – these dumplings were delicious! The dumplings were served first, as a first course perhaps. What followed was just as excellent, and it happened to be chicken fried rice and beef with peppers. The only reason I stopped eating before these plates were clear was because the sodium was really starting to make me bloat but that is the cost you pay when enjoying some fine Chinese food. The service was quick, the atmosphere quirky and definitely a unique experience to have in New York. 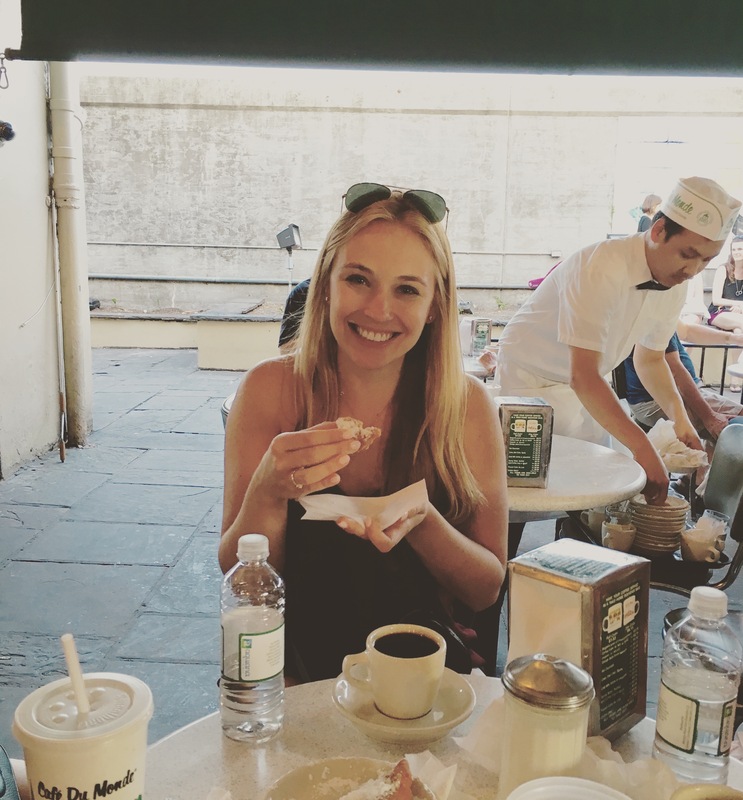 My first visit to New Orleans was for a bachelorette party. We were only in town for three days, two nights so we tried to see and do as much as we could. Anyone that knows me knows that I love to eat. Not in a gluttonous way but I appreciate good food and I always want more. Hence the name of this blog. This love of eating and cuisine is part of the reason I wanted to move to New York City. Assuming that there is no turnover among restaurants and one eats three meals a day, each one at a new restaurant, it would take approximately 22.9 years to eat at every restaurant in New York. To me, that sounds like a challenge.